If you’d like more information about what tools and accessories you need to buy, check out how sawhorses can create an affordable easy-to-set up workspace and check out my Resources page. If you’d have told me three years ago I would be writing a Power Tools 101 blog post, I would have laughed in your face. Aside from holding a power drill, I’d never been anywhere near a power tool! I was one of those chicks that had always wanted to learn, but the thought of even attempting it was intimidating. But I remember the first time I got my hands on some power tools. It was exactly three years ago at a DIY (do-it-yourself) blogging conference in Atlanta. Not only was I excited to be there because (hellllooooo!) 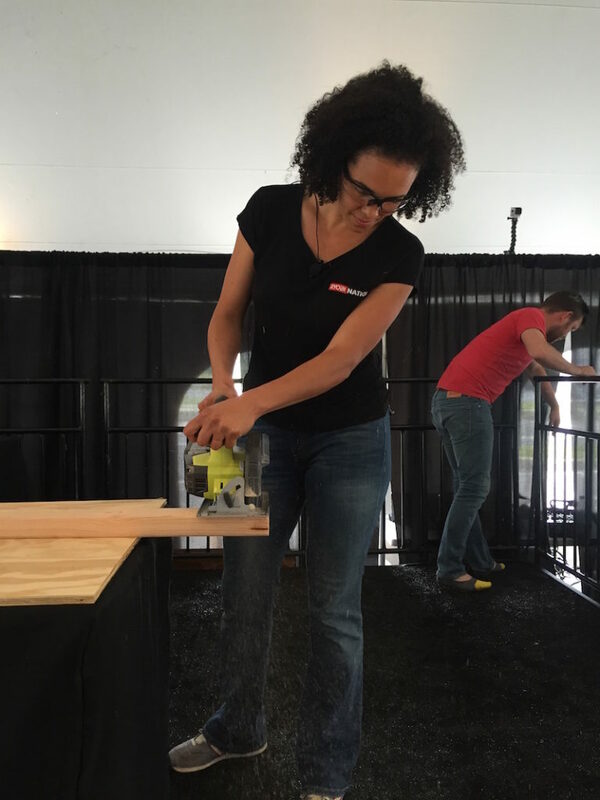 it was a trip away from home with fellow bloggers, but because there were–gasp–power tools workshops! You can see my excitement in this picture from the conference! 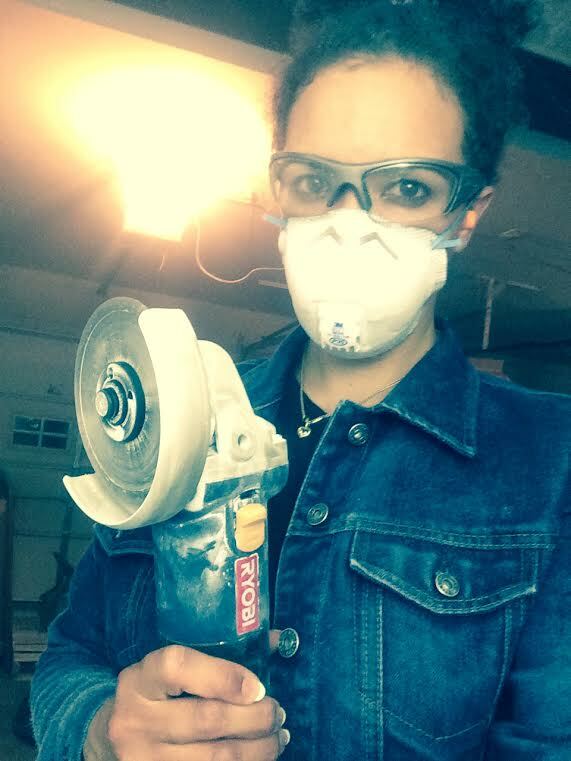 I fell in love with power tools and have never looked back! 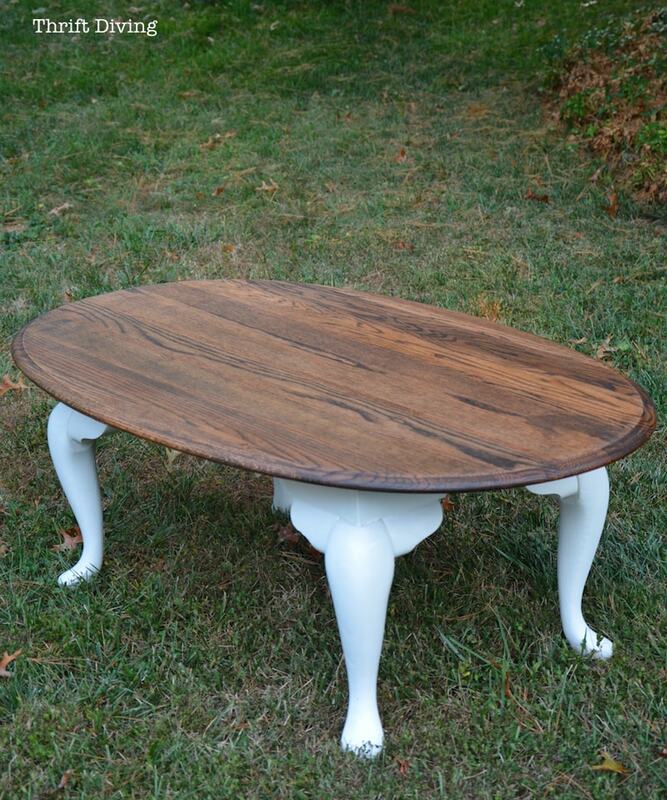 I love to use power tools to upcycle, repurpose, and refinish my second-hand thrifted finds! 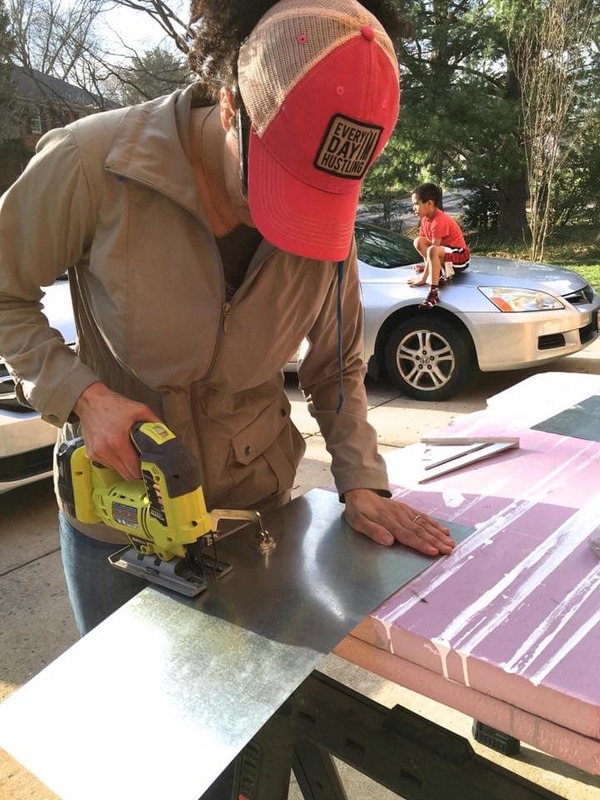 In today’s post, for those of you who have been wanting to learn to use power tools, this post will give you the resources and encouragement to at least use your first power tool so you, too, can feel like a total DIY badass! I’ve always thought of some power tools as less intimidating than others. So I always recommend newbie power tools users to start with a jigsaw first (in addition to a power drill, which you’ll read about later.). Depending on the type of blade you’re using, you can make curved, decorative cuts and straight cuts. It’s usually best for thin materials. So if you need to cut a thick 4×4 piece of wood, this would not be the tool to use. LOL. You wouldn’t build a fence with a jig saw or do any heavy-duty cutting. It’s my go-to power tool when I need to make quick easy little cuts for thin materials, like if I’m making wood crafts, such as my Wooden DIY Journal (which make great DIY gifts, by the way!) and when I used it to cut a thin sheet of galvanized metal to make a sign. How Do You Use a Jigsaw? The following 29-minute in-depth tutorial will walk you through how to use a jigsaw. Have you seen those awesome little wooden decorative cut-outs that people make of their kids’ names on the wall? Well, those are done by jigsaws! 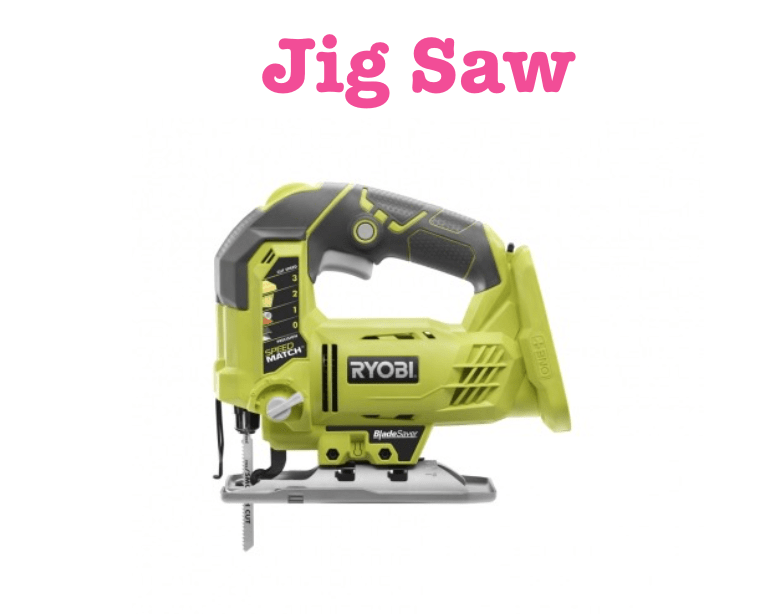 You might think they cost a lot, but jig saws are one of the most affordable power tools. You can buy a jigsaw (without the battery) for about $60. Be sure to pick up a 2-pack of 18-Volt Compact Lithium Plus batteries and a charging kit. You can use these batteries in over 70 RYOBI tools, so they’re a good investment! What Accessories Will You Need? Dual-cut blades by Starrett. These blades are game-changer! Watch the above tutorial to find out why you need these type of blades for your jigsaw. A pack of jigsaw blades. In addition to your Dual Cut blades, you should pick up a pack of jig saw blades, which will contain a bunch of blades for different types of cuts: blades for metal, blades for wood, blades for intricate scroll cutting, and more. This pack of blades will have it all! Clamps. Never use a jigsaw without clamping your material down first on a work surface. Circ saws (as they’re also called) are awesome because they can easily make rip cuts (when you slide a piece of wood up the length of the grain), cross cuts (when you’re cutting against the grain), and bevel cuts (when cutting at an angle). 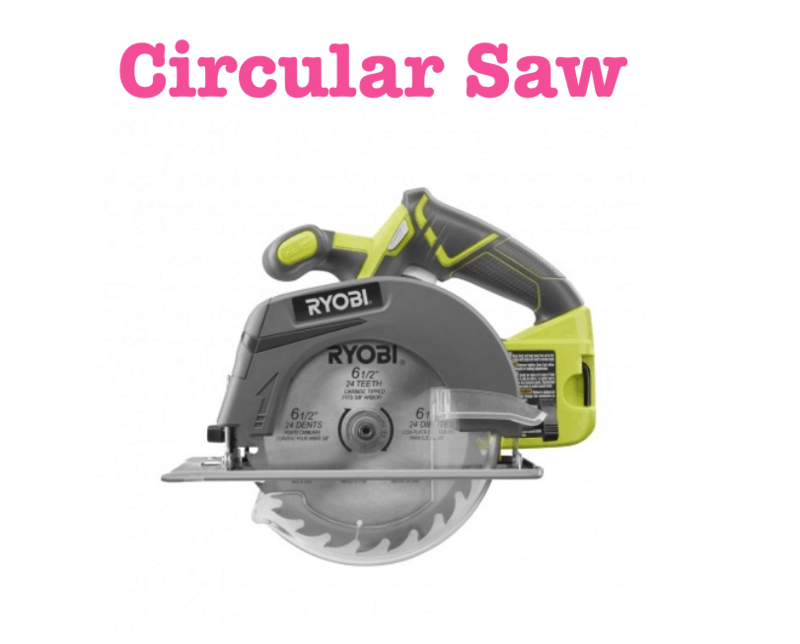 You can cut both wood and plastics with a circular saw! 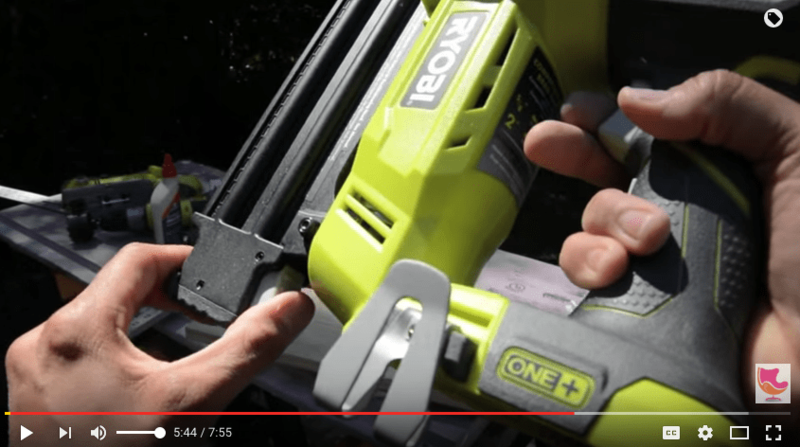 This video will walk you through how to use a circular saw. I think the question is what can’t you make with a circular saw! Ana White especially has a lot of great projects using 2x4s that you could make with a circular saw. Those are easy cuts! And this tool would get the job done. I do a lot of upcycling projects of thrift store furniture and I’ve used it upcycle a changing table into a desk by cutting off its legs. A cordless circular saw (tool only) will only run you about $69, but if you get it as part of a bundle, and around holiday times, you may find a deal at The Home Depot. There won’t be much you need when buying a circular saw! Most people don’t need to change their circular saw blade unless it needs to be replaced because it’s worn or you need to make finer cuts with a blade that has smaller teeth. Kreg Rip Cut. While this isn’t required, it’s definitely one of my must-haves! Your circular saw locks on and it allows you to make straight cuts. Watch this quick video clip of a project I was working, while using the Rip Cut. It’s an amazing accessory to own. Batteries. Some tools don’t come with batteries. Clamps. Be sure to clamp your work down before cutting. If you love refinishing furniture as much as I do, you need a sander! When painting furniture, if you’re using a chalky paint, you usually don’t have to sand. However, if your surface is bumpy, chipped, uneven, you’ll need a sander to smooth that baby out before painting. Or if you decide to strip it and restain, you’ll need a sander to get it super smooth and ready for stain. Even if you’re building something from scratch, you’ll need to smooth that wood, too. The question is, what type of sander should you get? Well, that depends on the job. Keep reading and watching to find out below! What Can You Sand With It? 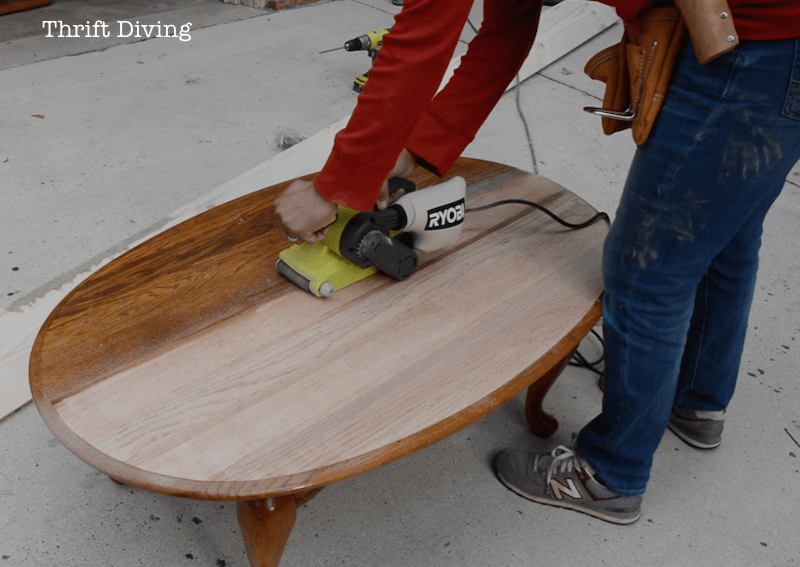 As you’ve seen in the video above, you can sand nearly any wood project, whether it’s a big flat piece of furniture, an intricate piece of wood with lots of details and small spaces, or something with lots of corners. 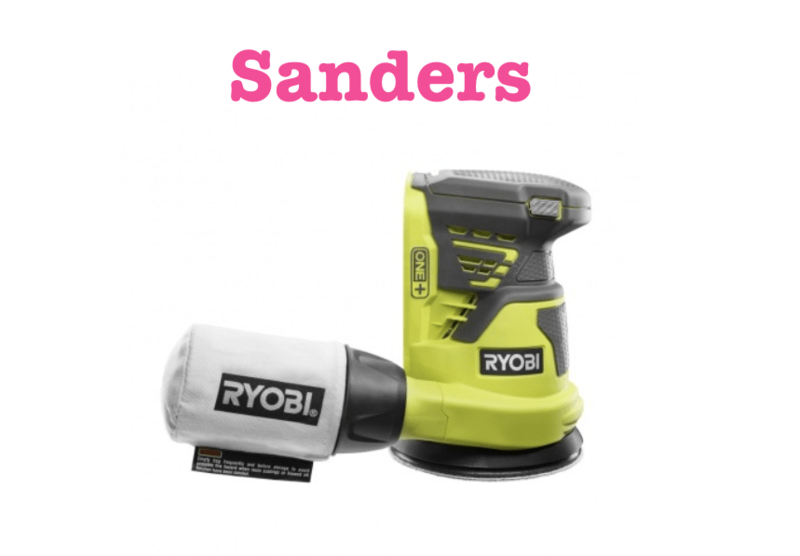 There’s a sander for each of the types of projects you’re doing. I refinished my $5.00 coffee table using a belt sander to get it done pretty quickly. 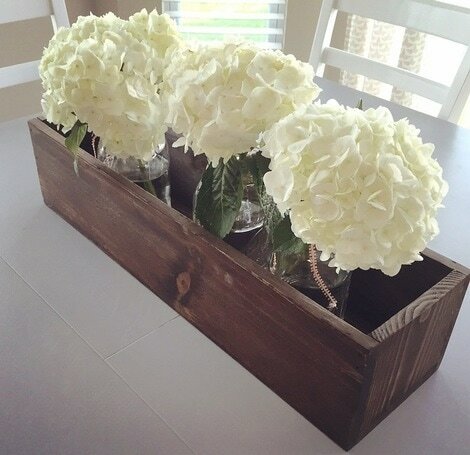 Here are some other sanding projects to inspire you! There are different prices for each of the sanders. My favorite sander is the orbit sander. I tend to use it much more than the other types because I’m usually sanding small dresser tops or something. Those sanders only cost $40!! Seriously, that’s a steal, considering the results you get! Check The Home Depot for other sander prices. Sandpaper. This is a must! You’ll go through this stuff like crazy! When refinishing furniture, you’ll need to start with tough grit first, around an 80-grit, then work your way down to a 150 medium-grit sandpaper, and then finish it off with something smooth, like 220-grit. Get all 3 to keep on hand! The type you buy will depend on the type of sander you’re using. 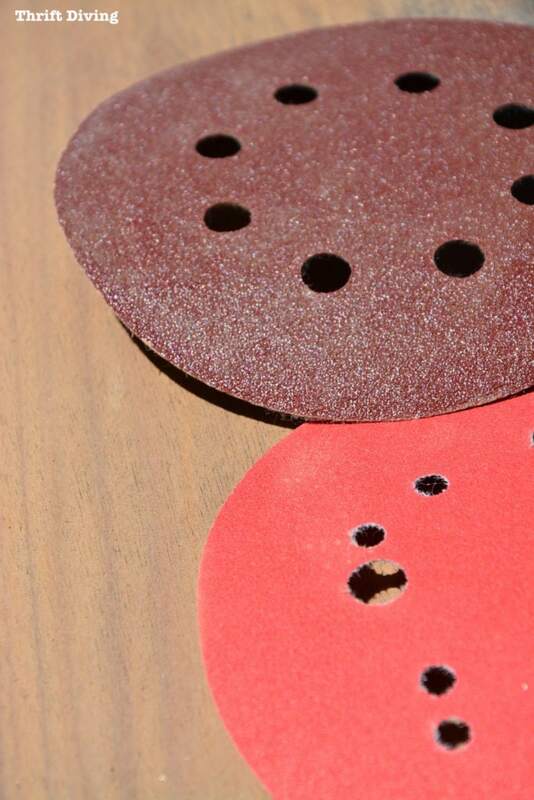 For example, these types of sanding discs are used on the orbit sander. 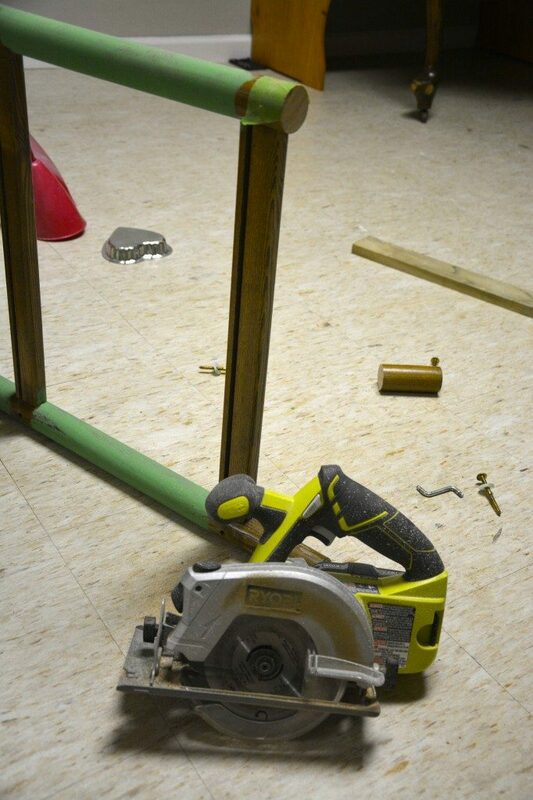 The miter saw is what I like to call “The Big Daddy” of power tools! LOL. It’s a large table-top saw and it’s what I recommend people use after they’ve gotten a feel for the smaller tools, like the jig saw and circular saw. Once you’ve mastered those and feel confident, then it’s time for the miter saw! 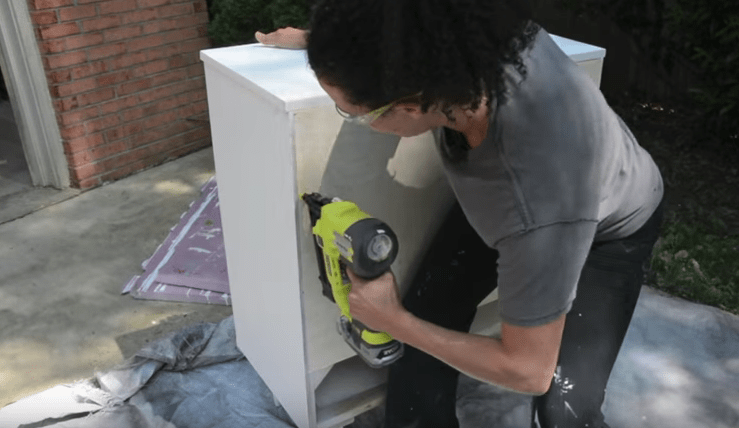 When you need a fresh, clean, precise cut, or want to put up crown molding or picture frames (which requires angled cuts), then the miter saw is the way to go. 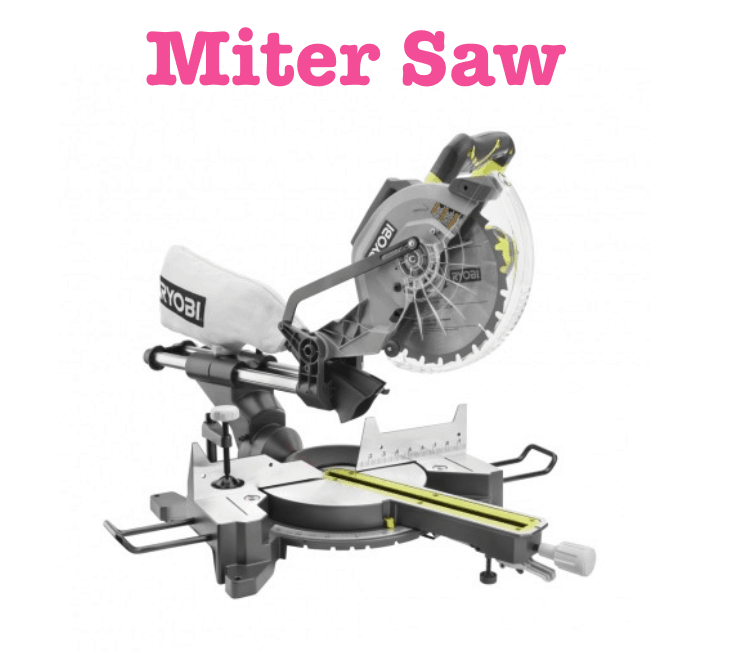 This video will help you with understanding how to use a miter saw! As I mentioned above, crown molding and picture frames are what this big guy is best known for, along with simply getting great straight and angled cuts. DIY Crown Molding. Check out my full 52-page guide on how to put up crown molding like a novice! It’s okay for crown molding not to be perfect. This guide will help you get it done, perfect or not! Picture Frames. I’ve never made picture frames, but the miter saw makes it possible. Out of all the power tools listed here, this one is the most expensive. The prices range, depending on the type of miter saw you get ($119 – $199 for a 10″ compound or sliding miter saw versus $249 for a 12″ sliding compound miter saw). Just depends on how much power you need and what size boards you plan to cut (TIP: You can cut wider boards up to 13.25″ with the larger 12″ sliding miter saw). Miter saw stand. While you don’t need a miter saw stand, I highly recommend it, especially if you’re cutting long boards, like crown molding! You need something to hold up the long pieces of wood while cutting, and a miter saw stand will do this. It’s about $99. Clamps. If you don’t have a miter saw stand and just have it on a table or something, you’ll need to make sure you’ve got the back of it clamped to a table, otherwise it could tip over. That’s how my current set-up of my miter saw is position; it’s just clamped to a small workstation. But it’s hard to cut large pieces of wood without assistance, so I’m upgrading to a miter saw stand. This is one of my favorite power tools because you can make so many things with it! If you didn’t have a saw and just had The Home Depot cut pieces of wood for you, you’d still need a way to nail it all together, wouldn’t you? That’s where the brad nailer comes in. You can make countless crafts with it, too, along with putting up decorative molding around your home! The biggest thing about using a brad nailer is knowing how to load the nails! Once you see how easy it is, this tool won’t intimidate you. Watch this clip below to see how I loaded it during a project. Decorative wall molding. Brad nailers are awesome for easily securing decorative wall trim! Along with some Liquid Nails on the back of your wall trim and using your brad nailer with 18 gauge nails, you can create some visual interest in any room! 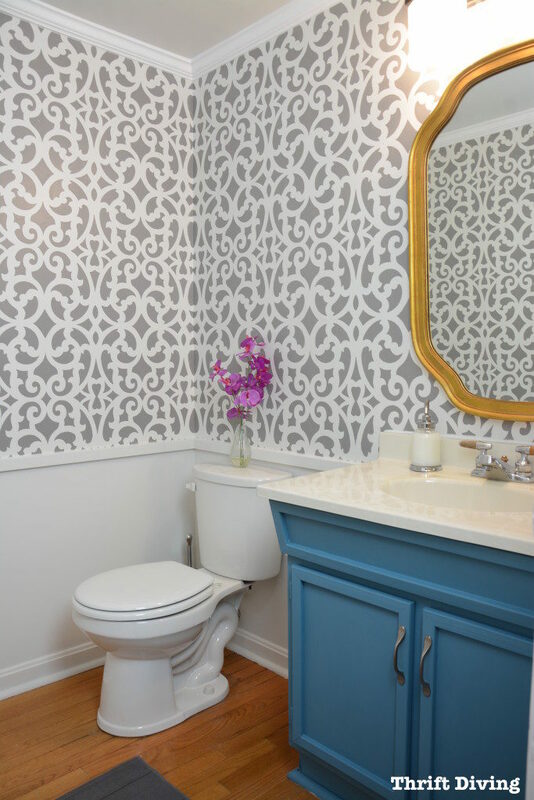 In my pretty gray stenciled half bathroom makeover, I used 1 x 3 boards to break up the wall with stencils on top (using my favorite stencil), and then painting below the trim in a solid white. (NOTE: The crown molding was installed with a finish nailer which uses 16 gauge nails. Don’t get these two tools confused. Finish nailers use 16-gauge nailes, which are bigger and are designed for crown molding). Nailing together small lightweight materials. 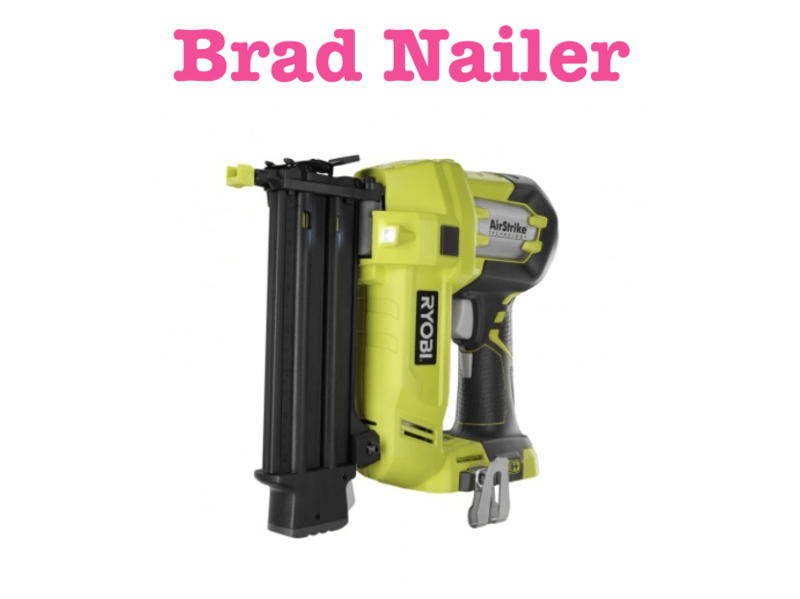 Brad nailers are also great for nailing together lightweight materials, like if you’re making a craft project, nailing a piece of wood to the back of a dresser, and other lightweight projects. 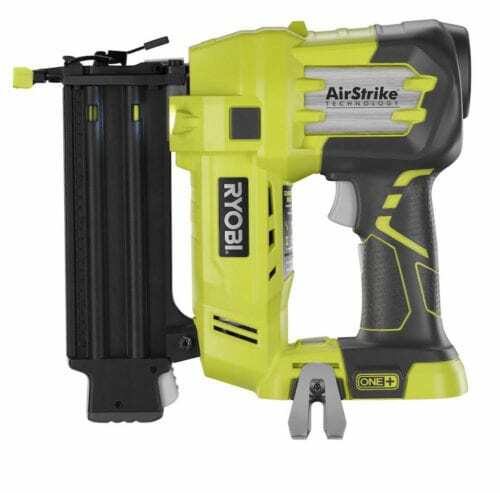 You can get the 18-Volt ONE+ AirStrike brad nailer (it’s cordless!!) for $119, but be sure to pick up some batteries, like I mentioned for the other tools. 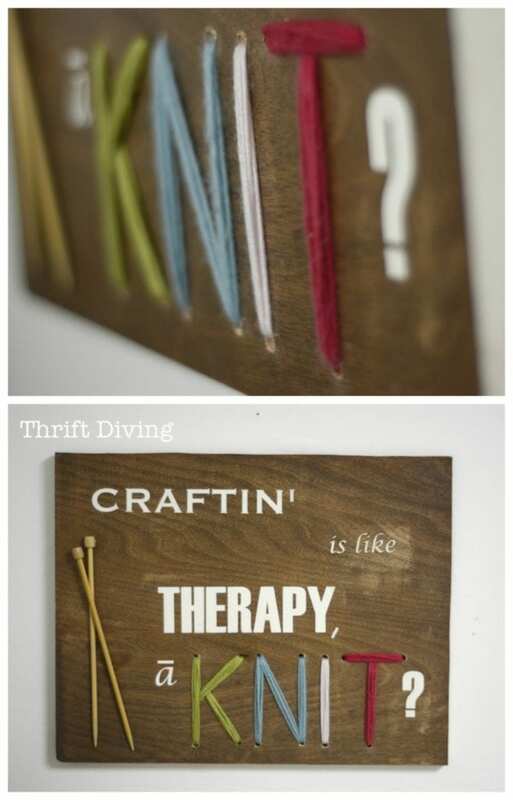 With all the projects you can do around the home, including crafting projects, it’s worth it! Lots of brad nails! 🙂 Trust me, you’ll go through nails quickly if you’re using your nailer often. I like to get packs of 18-gauge nails that have all different lengths (up to 2-inches) because sometimes you’ll work with thinner materials and other times thicker materials. For wall trim, I like to use 2-inch brad nails and secure them to the studs. 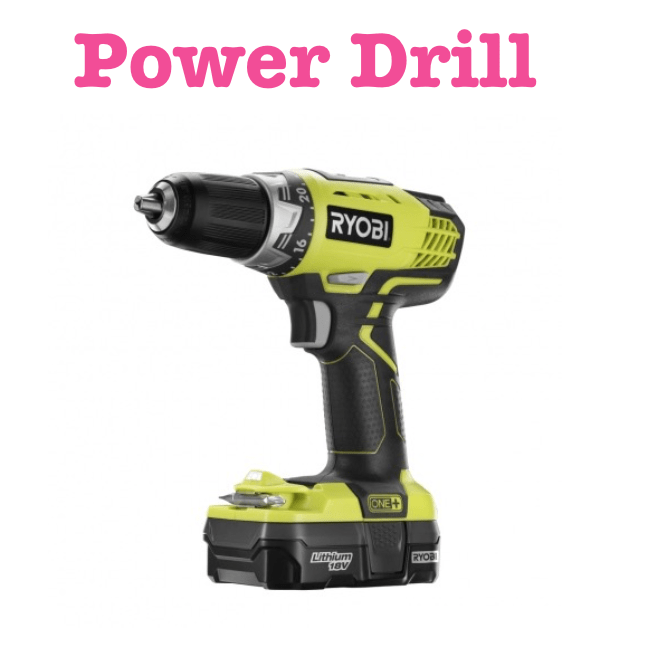 I can’t talk about power tools without mentioning the power drill! Many people think it’s just for driving bits–you know, screwing things in quickly and easily. But it’s also great for drilling holes into everything from wood, plastic, brick, and concrete. A drill is super easy to use. Click here to watch a short clip from a project I was working on, where I show you how to load a drill bit by loosening the black chuck and then giving it a tug to make sure it’s secure. It’s also got an on-board magentic so that you can store loose screws while working on a project! 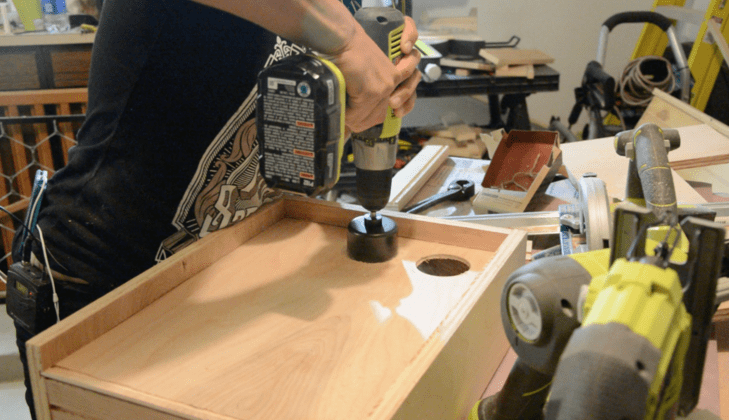 What Can You Make With a Power Drill? Pilot holes. Hanging some curtains? How about wall art or shelving? Most things hung on your walls will need screws with anchors. Some anchors require you to drill a little pilot hole first, like in the above video, so that you can add a little anchor to help the drywall withstand the weight. That’s where power drills come in handy! Projects with screws! Above I mentioned using a brad nailer to secure things together. Well, you can also use power drills to screw pieces of wood together with various types of screws. It just depends on the project and the materials you’re working with! Decorative holes. Check out this project on How to Weave Yarn in Wood. The power drill is another tool that costs next to nothing. It’s $69 at The Home Depot, and this one comes with a battery and charger, so it’s a good deal. Drilling and driving bits. You can’t use a drill without drilling and driving bits, my friends! I recommend the 90-piece set because you get everything you need in one set, including hole saw attachments, which is the other accessory I recommend below. Hole Saw attachments. Well, you don’t need them, but they’re super nice to have and allow you to get creative with a power drill! You just attach it to the end of your drill, and it’s got super MONSTER teeth, and it just tears through the wood, leaving a nice, neat hole! 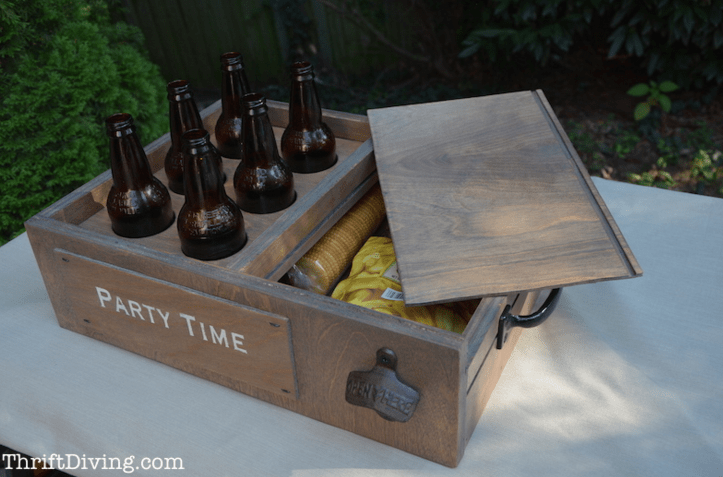 Hole saw attachments allowed me to create this super cute DIY drink holder with a secret snack compartment! 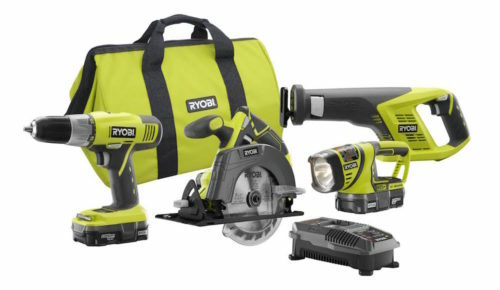 I know that power tools can be expensive, so I’m always excited when RYOBI allows me to give away tools for free! So for those of you that actually made it to the bottom of this looooongg post (you guys are rockstars! ), there’s a special reward for you all: a chance to win an AirStrike nailer and a combo pack of tools! To enter, all you have to do is leave a comment below and tell me which tool you’re most excited to use and what you would make…..and for a second entry, just PIN THIS post (be sure to leave a second comment telling me you pinned it). So What To Do Next?? That’s a lot of information to take in, isn’t it?! After reading that post and understanding what safety tips you need, you’ll be ready for your first power tool! Remember, always read the safety manual from front to back, and if you have questions, don’t be afraid to contact the brand with questions! 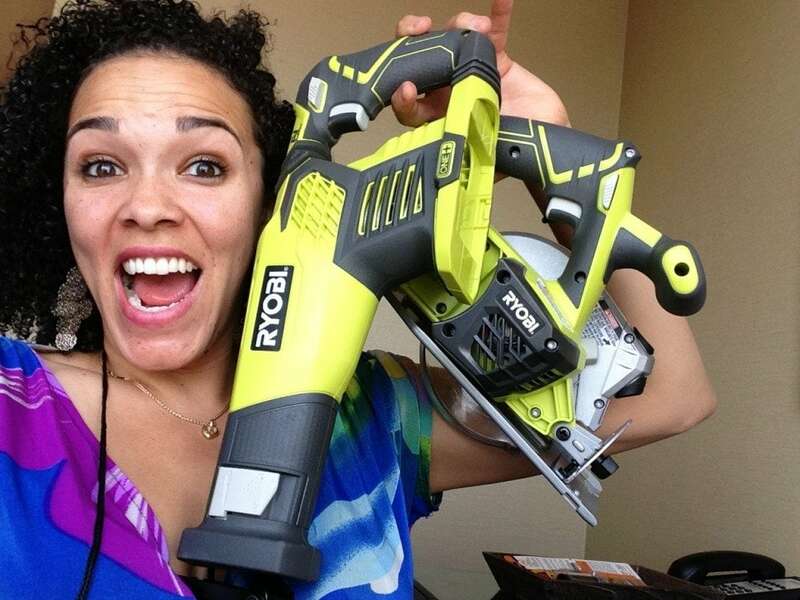 So are you ready for your first power tool?? Which one is most exciting to you and what would you make with it? 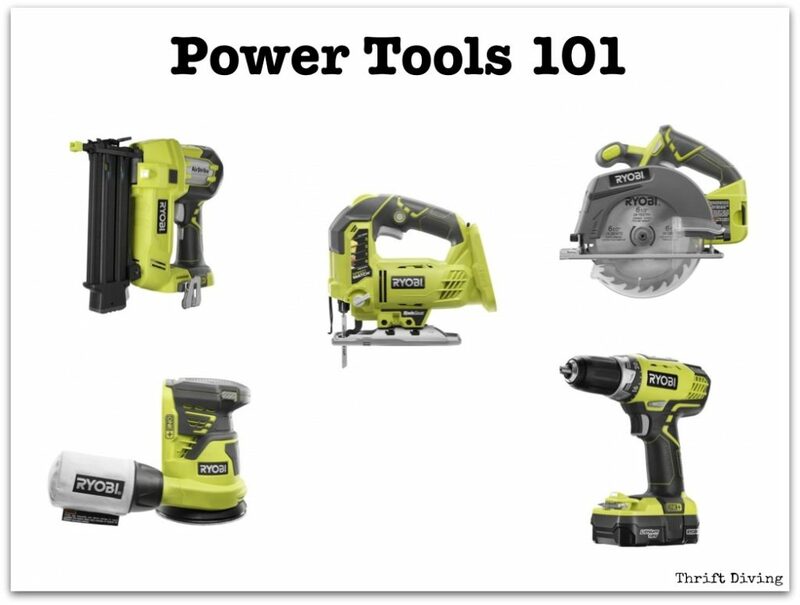 For more tips and tricks on using power tools, visit RYOBI Nation’s Power Tools 101 website! Power tools are really very much helpful when any homeowner wanna to renovate his or her house, garden or any other woodworking related tasks. But if any newbie took the basic tools for use then I think a proper guideline must be followed. so here need one thing that proper guideline step by step power tools user manual, For the safety and proper cutting the wood and using the power tools perfectly it’s very important to know how to use it. so I think writer must update this content. Just discovered your blog, love it! I have a lot of tools but really need a miter saw and the nailer! Looking for a new jig saw and orbital sander ( mine are hand me downs) and currently wanting to learn to use a router! Power tools can be very dangerous for those who don’t know how to use it. Here I can found the complete guideline for power tools, Including buying right tools and how to use it. Thanks for the informative content. I love all the tools you have shown, in fact, it looks like my garage, with the only exception, that my Ryobi Miter saw is blue (older model) The one thing you failed to mention is that the Ryobi 18v one+ line of tools (all the ones you’ve shown here and many more) all work with the same batteries. This means that you can purchase a few batteries (as much as $100 ea) to run ALL of your cordless tools. While my collection is extensive, there are a couple that I still need to complete my cordless tool collection. The brad nailer you are showing here is one, as it is fairly new and I have been using an older air powered set of nailers. The other would be the cordless belt sander, which only came out this past year. I prefer the cordless tools because (obviously) there’s no cord to get in the way, and if you’ve ever cut thru your own cord you know it is much SAFER also. Of my collection, I will mention that my favorite all around tool is my multi-tool. I have several different heads for it for drilling, sanding, cutting. While the Ryobi multi-tool only comes with the standard head, the Rigid multi-tool heads fit exactly for additional tool options including jig saw, drill, impact driver, reciprocating saw, and auto hammer. Here is a link to a pic of the set. Love your work and your posts, keep up the great work. Really extensive and well thought out list! I really appreciated all the videos and pictures to help drive your point home. Great article!